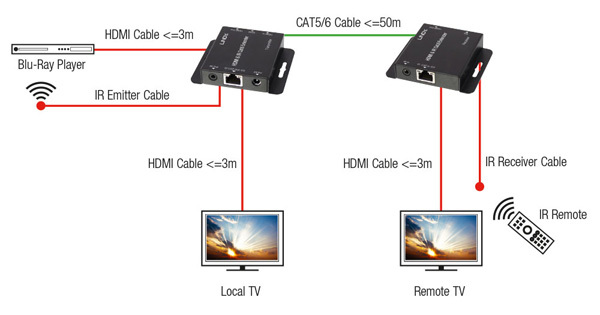 The HDMI & IR Cat.6 Extender is a simple to use plug and play solution which lets you extend an HDMI AV signal up to 50m using a single low cost Cat.6 UUTP cable (not included). For added convenience IR signals (20-60 kHz) can also be extended using the supplied IR Receiver and Emitter cables. Supporting resolutions up to Full HD 1080p, including 1080p 3D, the Extender is designed for use in AV and digital signage applications in a variety of settings such as home, education, business, retail and healthcare. The Extender features an HDMI loop-through output on the Transmitter with simultaneous viewing so that a local display can be connected for monitoring or to create an additional viewing zone. To ensure the maximum compatibility when two displays are connected the EDID data, which determines the supported video and audio formats, can be used from either a local monitor connected to the Transmitter or the remote monitor connected to the Receiver. Power over Cat.6 (PoC) functionality enables the Extender to operate from a single power supply connected to the Transmitter, allowing the Receiver to be located where there is limited access to mains power sockets making it ideal for retro fit installations. In addition to PoC functionality the Extenders slim design makes it easier to install in limited spaces behind modern flat screen displays. * Please Note: The quoted lengths and resolutions are possible with a direct connection between Transmitter and Receiver using good quality Cat.6 solid core cable. Using a different cable type, or introducing wall plates, couplers or patch panels will result in a reduction of possible distances.